Is 5G really going to beat Wi-Fi? If you believe the current flow of industry news reports, the race to 5G has begun. Big network vendors are testing 5G prototypes in their labs at blazing bit rates. A Huawei VP recently said “5G would transform the world”. Network giant Ericsson says that 5G will connect billions of machines to the Internet. And the list goes on. 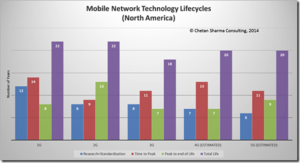 The mobile industry paints a picture of 5G as another flawlessly executed mass-market, wireless success story. It also likes to think that 5G will happen as naturally as night follows day. The truth is that the road to 5G is a very steep climb. Add to that one of the biggest roadblocks: The immense popularity and success of Wi-Fi. But let’s start with some 5G facts: The 5G standard does not exist today nor is it close to existing. Some industry sources expect 5G to happen already in 2020 but this is wishful thinking. According to industry analyst Chetan Sharma it will take six years to standardize 5G and 11 years for 5G to reach maturity. On a tech time scale this is practically an eternity. Meanwhile the wireless industry will not sit around waiting for 5G to happen. Even if the 3GPP were to get through their vast 5G standardization task in record time, a new cellular standard will likely be too little, too late. Carrier revenues have been almost flat or declining since 2007. Billions of dollars continue to be sunk into licensed bands and infrastructure but this cannot continue indefinitely and consolidation options are running out. Fortunately, the right technology to pick up the slack from mobile is already here. Actually, Wi-Fi is already more than picking up the slack. Wi-Fi is by far the biggest carrier of wireless data in the world. Some 80% of traffic on 4G devices runs over Wi-Fi and public Wi-Fi networks are growing at an unprecedented rate. 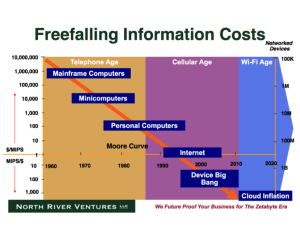 The underlying reason for this is fundamental: Wi-Fi is the only technology capable of keeping up with the free-falling price/performance ratio (also known as Moore’s Law) that the tech industry has been racing down for some 50 years. This curve is (as far as we know) irreversible. We’ve left the Age of Cellular behind. – Wi-Fi keeps device costs ridiculously low because it owes no royalties to anyone. Any 5G device will demand a $30-$40 dollar premium just to cover royalties on the 5G chipset. Compare that to a few dollars per Wi-Fi chipset. – Wi-Fi already connects to hundreds of low-cost SIM-less devices per access point and is the perfect technology to address IoT, an explosion of wearables, consumer goods of all kinds, and lots of things that we can’t even imagine today. We don’t need to wait for 5G to do that.